President Salvador Sanchez Ceren, inaugural speech, June 1, 2014, San Salvador. Photo courtesy of Vivien Feyer. The crowd was jubilant. Ecuadoran President Rafael Correa waved triumphantly to the thousands who filled the open air convention center. He walked down the red carpet just a few meters away from us to thunderous applause. We were honored guests at the inauguration of Salvadoran President Salvador Sanchez Ceren and Vice President Oscar Ortiz. Both the incoming President and Vice President had been Farabundo Marti National Liberation Front (FMLN) military commanders during the civil war. They had fought the oligarchy for power militarily for more than a decade. On March 9, they won at the ballot box by the slimmest of margins. Honored guests indeed. Three seats to my right sat Manlio Argueta, winner of the Casa de Las Americas Prize, Latin America's most prestigious literary award. In addition to being a novelist and a distinguished poet, Mr. Argueta is a committed social activist. His book One Day of Life is a harrowing tale of the brutal repression meted out to El Salvador's campesinos. 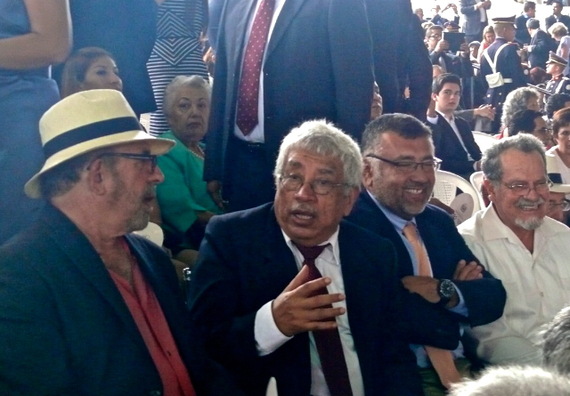 Manlio Argueta, second from left, at the Salvadoran Presidential Inauguration, June 1, 2014, San Salvador. Photo courtesy of Vivien Feyer. Several seats to my left sat Dr. Charlie Clements, an American doctor, who provided medical care to the thousands of Salvadoran campesinos living in the Guazapa volcano region during the height of the war. Charlie's account of his year in Guazapa, Witness to War is a chronicle of severe deprivation, chronic hardship, brutality and tragedy. It is also a chronicle of enormous bravery, profound commitment and enduring hope. The book was made into a movie of the same name, which won the Oscar for best short documentary in 1986. My partner, Vivien Feyer, and I had the pleasure of accompanying Charlie to Guazapa two days before the inauguration. Dr. Charlie Clements, May 2014, at the memorial to boys, girls, women, and men killed in Palo Grande, Guazapa region during the Salvadoran Civil War. Photo courtesy of Vivien Feyer. The Vice President of Cuba (wild applause), and the Vice President of Venezuela (wild applause) came down the red carpet just to our left followed by other dignitaries. When Evo Morales, the President of Bolivia, was announced he received an ovation worthy of a rock star. And so it went with the conspicuous absence of any high level delegate from the United States. Salvadoran President Salvador Sanchez Ceren being warmly greeted by Bolivian President Evo Morales and other heads of state and foreign dignitaries, Salvadoran Presidential Inauguration, June 1, 2014. Photo courtesy of Vivien Feyer. The U.S. delegation was led by The Honorable Maria Contreras-Sweet, Administrator of the U.S. Small Business Administration. Bolivia sent Evo Morales. Ecuador sent Rafael Correa. We sent someone from the Small Business Administration. Was that Obama's message? El Salvador was small business. Once El Salvador was crucial to U.S. interests, so much so that we sent one million dollars a day in military aid. U.S. aid flowed to El Salvador under President Reagan at the same time that the Salvadoran military and right-wing death squads were killing a thousand Salvadorans each month. The United States paid for the carnage. We trained the perpetrators and the architects of the slaughter which included horrendous mutilations and unspeakable tortures. Napalm and white phosphorus were dropped on Salvadoran men, women and children from airplanes supplied by the U.S. Most of those who were killed were civilians. Many were women and children. Some had joined unions. Others had formed agricultural cooperatives. Still others were followers of the brave priests and nuns who preached liberation theology. They were organizing to better their meager standard of living. The right wing oligarchy saw them all as subversives and attacked them brutally. Each and every month during the height of the repression, El Salvador was losing proportionally as many of its people as the U. S. lost in the entire Vietnam War. U.S. President Ronald Reagan defended El Salvador's brutal military repression as necessary to prevent the spread of communism. By the time the war had ended and a peace settlement had been signed, 75,000 Salvadorans had been murdered, including their beloved Archbishop Oscar Romero. Those who defended the campesinos from the military repression, the FMLN, were now in power through a fair election. The appropriate action would be for the U.S. to apologize for funding the repression and to offer to pay reparations. A high level delegation should have been sent to recognize the new Salvadoran leadership, who embody the hopes and the dreams and the sacrifices of the poor. Wouldn't it be a good idea to be on the side of justice and human rights? But rather than send a high level delegate, rather than offer reparations, rather than extend our hand in friendship to the new Salvadoran administration, the United States is actually trying to bully the Salvadorans. The U.S. is trying to force El Salvador to use Monsanto's GMO seeds rather than their own indigenous seeds or risk losing nearly $300 million in aid. At issue was an indication by U.S. ambassador Mari Carmen Aponte that the U.S. may withhold $277 million slated for the second phase of the Millennium Challenge Corporation aid program if the Salvadoran Agriculture Ministry continues its current practice of buying seeds from small-scale Salvadoran producers for its Family Agriculture Plan. 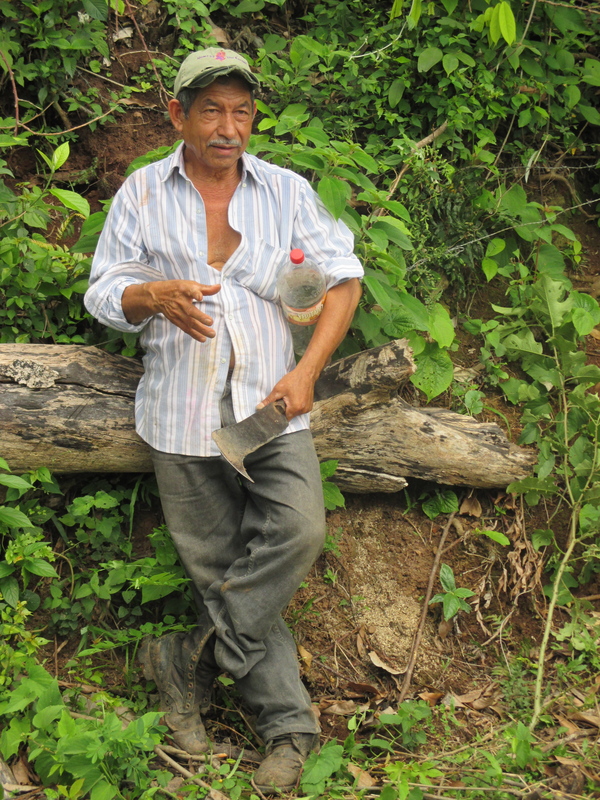 To the Salvadorans, using indigenous seeds makes sense both economically and agriculturally. Over millennia, nature has adapted these seeds to the Salvadoran climate and soil. But there is another equally pressing reason to avoid Monsanto's GMO seeds. Monsanto engineers its seeds to be resistant to its own pesticide, glyphosate (Round-Up). The pesticide needs to be applied to kill unwanted weeds. That's the scientific rationale for producing GMO seeds. They are pesticide resistant. Farmers can drench their fields in glyphosate, killing off the weeds without damaging the pesticide resistant crop. But the farmers themselves are not resistant to the toxic pesticide. Salvadoran campesino returning from working in the fields, Guazapa region, El Salvador, May, 2014. Photo courtesy of Vivien Feyer. For years, scientists have been trying to unravel the mystery of a chronic kidney disease epidemic which has hit Central America, India and Sri Lanka. Unlike in most kidney diseases, the kidney tubules are the site of injury, not the kidney's complex filtration apparatus. New research has shown that glyphosate has the unique ability to bind with heavy metals like cadmium and arsenic. The glyphosate-heavy metal complexes appear to be toxic to the kidney tubules, and may be the cause of this worldwide kidney disease epidemic. Are we in the United States going to insist that the Salvadorans use Monsanto's seeds which require Monsanto's pesticide, glyphosate, given the real fear that glyphosate may be a major cause of a worldwide epidemic of chronic kidney disease? Are we going to claim that we know better than El Salvador's farmers which seeds are better suited to their local conditions? Are we going to demand that El Salvador, a poor agrarian nation, buy its seeds from a transnational corporation year after year rather than develop a program of local seed sovereignty? Are we going to pretend that we didn't fund a brutally repressive regime responsible for crimes against humanity and do nothing to help heal the wounds we caused?